This is the second in our short series of radio transcription recordings made by the BBC at the Edinburgh Festival of 1962. These concerts were not broadcast at the time but appeared on transcription discs, most likely aimed at the US radio market, which should have been destroyed after use. The announcements here suggest two programmes were intended. The concert recording runs to nearly 92 minutes and is available in full in our download and streaming formats. We have had to cut the opening item, Tchaikovsky's Francesca di Rimini for this CD release in order to fit a single disc. Those buying the CD do of course get a free copy of the MP3 download which includes the Tchaikovsky and additional announcements not present on this disc. The recording itself is in fine BBC stereo. 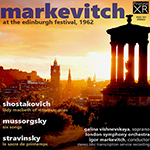 XR remastering has served to bring out a rather light bass, especially in the Stravinsky, conveying much more of the power and intensity of the performance.